After months of waiting, you’re finally ready to jump in and learn about the WordPress Gutenberg block editor! In this introductory lesson, we cover Gutenberg block basics. We start with an introduction to block concepts — explaining what blocks are and where blocks come from. You’ll also learn how to find blocks, how to add and move blocks, and how to remove blocks from your post or page. This tutorial covers the basic concepts that apply to nearly every block. Future lessons dig deeper into block types and specific blocks. Great lesson, Kirk. I’m looking forward to working with Gutenberg very much. You’re welcome, Joost. To the future! Your Gutenberg videos are very well done and most helpful. But, why would we want to use Gutenberg if we are already using Page Builder? Thanks so much for sharing great information! Thanks, and great question. The answer is, you likely won’t use Gutenberg if you’re already using another page builder plugin. Some future version of Gutenberg may offer a more full featured alternative to what current page builders can accomplish, but we’re not even close to that yet. This is the first iteration of a long-term process. Nice Tutorial video about Gutenberg Block Basics. Setup WordPress and start building your website today with ten of our most popular video tutorials. Learn the basics in under an hour. Our comprehensive, two-hour Gutenberg course is broken down into 19 lessons. Covers all of the core Gutenberg blocks. How Much Does WooCommerce Cost? Are You Ready For Gutenberg Phase Two? 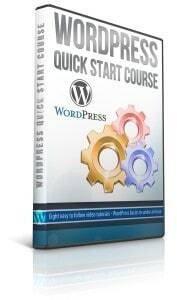 Get Started With WordPress Today! Learn the basics in under one hour.